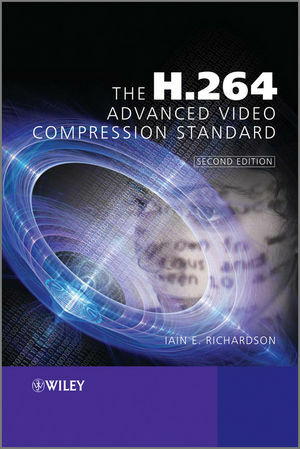 Packed with clear examples and illustrations to explain H.264 technology in an accessible and practical way. Covers basic video coding concepts, video formats and visual quality. Explains how to measure and optimise the performance of H.264 and how to balance bitrate, computation and video quality. Analyses recent work on scalable and multi-view versions of H.264, case studies of H.264 codecs and new technological developments such as the popular High Profile extensions. An invaluable companion for developers, broadcasters, system integrators, academics and students who want to master this burgeoning state-of-the-art technology. Dr Iain Richardson is currently a Reader in video communications and also a Lecturer in digital communications, computer networks and digital electronics in the School of Engineering at the Robert Gordon University. His research interests include video compression and transport and multimedia networking. Dr Richardson is an experienced author, having written the books H.264 and MPEG-4 Video Compression: Video Coding for Next-generation Multimedia (Wiley, 2003), and over 40 conference and journal papers. He has also been working on the development of video compression systems since 1993, and now is a convener for the Image Communication Technology Research Group, at the Robert Gordon University. 1.1 A change of scene. 1.3 The role of standards. 1.4 Why H.264 Advanced Video Coding is important. 2 Chapter 2: Video Formats and Quality. 3 Chapter 3: Video Coding Concepts. 3.6 The hybrid DPCM/DCT video CODEC model. 4 Chapter 4: What is H.264? 4.3 How does an H.264 codec work? 4.5 H.264 Profiles and Levels. 5.3 Frames, fields and pictures. 6 Chapter 6: H.264 Prediction. 7 Chapter 7: H.264 transform and coding. 8 H.264 conformance, transport and licensing. 8.2 Conforming to the Standard. 8.3 H.264 coding tools for transport support. 8.4 Transport of H.264 data. 9 Chapter 9: H.264 performance. 10 Chapter 10: Extensions and directions.